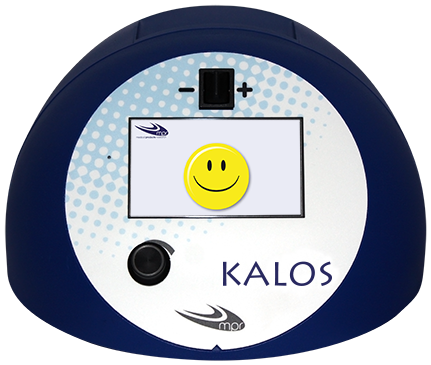 Kalos is the answer to the growing awareness of having to use different techniques to improve the effectiveness of airways clearance therapy and patient compliance. In addition to the cough assist function, Kalos integrates EFA (Expiratory Flow Accelerator) technology for the deep secretions’ removal, the possibility of performing lung re-expansion maneuvers with the Constant Pressure function and to verify the effectiveness of the cough of the patient with a peak expiratory flow indicator. The use of Kalos is easy and intuitive because all the available functions are displayed simultaneously on a color display and can be selected with the use of a single control knob. Equipped with an internal battery, light and small, it is easy to use both by the healthcare professional and the care giver. Worldwide, MPR represents an example of dedicated workmanship reflected not only in the quality of our products but also, above all, in the continuous effort we make to sustain patients in their medical treatment.